How do you tell a story whose ending your audience already knows? Anurag Sinha’s Kesari, starring Akshay Kumar, is a lesson on how not to do it. The film is based on the 1897 Battle of Saragarhi, fought between the British Indian Army’s 36thSikh regiment comprising 21 soldiers and a large army of Afghani pathans. The screenplay, despite bringing a new subject to the screen, struggles in its most intense moments. Kesari begins where most battles fought in films do –over a woman’s honour. We start off with Akshay Kumar as Hawaldar Ishar Singh fighting pashtuns to rescue a woman from being killed ‘for honour’ somewhere in Khyber-Pakhtunkhwa (in present-day Pakistan) while patrolling the British Indian territory. This invites an attack on the forces in Gulistan fort but Ishar saves the day yet again. However, as punishment for triggering such an attack he is sent off to Saragarhi fort, which serves as a communication point between Gulistan and Lockhart Fort. Akshay Kumar’s Ishar Singh of the 36th Sikh regiment sees the actor play a strong, righteous minded soldier of the British Indian army who is aware of his position as a ghulam of the British despite his strength and bravery. Kumar does not let go of any chance to paint his act with the Sikh pride but he does so with flat dialogue delivery. Despite being the only character with motivation-infused dialogues, his act falls apart as he comes across as pedagogical. With Kesari, Akshay Kumar is back to doing what he does best: action. Don’t let the dialogue delivery fool you because Kumar does cut in some spectacular sword and gun fights with ample slo-mo shots to highlight his star status. However, after a point Anshul Chobey’s Kumar-centric cinematography of the fight sequences simply saturates the viewer with his assertions to fight for the British Indian army albeit to earn respect for Sikhs. The pace of the film weirdly manages to feel rushed in some areas and prolonged in others. It would have left a greater impact with more screen space and background build up on the 21 soldiers. It follows the usual tropes of a letter from home and a handkerchief of a loved one. Girish Kohli’s screenplay misses a good opportunity to decorate the Saragarhi soldiers’ characters with more depth and characteristics to make them stand out and be memorable. While the movie is based on the bravery of Sikh soldiers and even mentions at the very beginning that the British depended heavily on the Sikh to guard their troubled borders in Western British India, the movie barely manages to show any new side to the Sikh soldiers that hasn’t already been put on screen. And this happens despite Sinha, a well-established Punjabi filmmaker, being at the helm of affairs here. The movie attempts to cover too many issues without exploring any in particular. It sketchily weaves in caste bias, masculinity, army-politics duality, secularism and jihad. These loaded subjects come over and above the film’s core theme of Sikh pride, patriotism, colonialism and fight for Independence. We are well aware of Akshay Kumar’s aim to take upon socially relevant themes, but Kesari delivers a whole syllabus on social and political justice for you to take in. 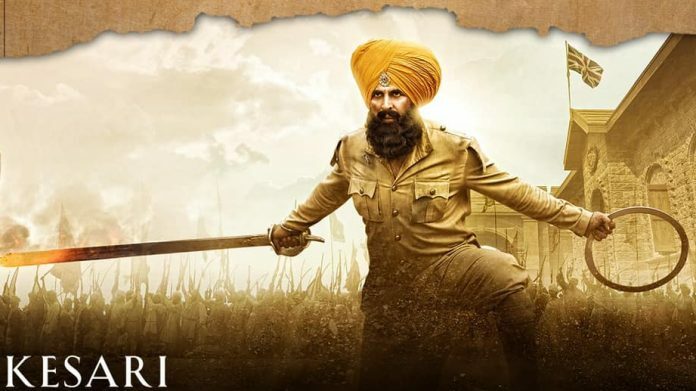 Kesari’s soundtrack is laden with heavy music with robust drum rolls to heighten the action but Parikshit Lalwani and Kunal Mehta’s score fails to hold the intensity of some of the film’s most intense moments. As a result, the fear and confusion of the 21 soldiers never hits your nerve. When the Pashtuns let out their battle cry, an ill-placed sombre song instantly tells us that this will be a lost battle. The choreography of the battle scenes, however, standout. Unlike this year’s Manikarnika, also based on a historical battle, Kesari sheds enough light on the enemy and doesn’t just use them as props who are slit open and bombard upon. Special mention for the beautifully carved guns and rifles the Pashtuns flash. Kesari’s story of the battle of Saragarhi has been delivered to us after several failed attempts by numerous filmmakers and stars over the years. The effort is commendable but its singular focus on Akshay Kumar with excessive dramatisation takes away from the tragic end of the soldiers who laid down their lives. The lack of attention on other soldiers of the regiment makes us wish there would be another film that takes on this historic battle as Kesriclearly needed to give a second thought to its priorities. This movie is awesome! I watched it with my friends and it’s just so beautifully portrayed by director Anurag Singh! Akshay Kumar has played his character perfects and I think this movie is going to break a few records in the Box Office!